If you’re in need of a little break from ADE this weekend, here’s something you should definitely check out. 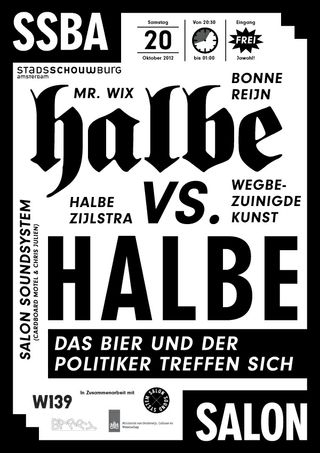 Halbe is a new brand beer that donates all of its profits to the cultural sector. Their launch party is this Saturday at the Stadsschouwburg, hosted by SSBA Salon. Not only will they be showing off their new HalbeHalbe (a 0,25L edition), you will also get a glimpse of their new website and other future plans. Halbe has also invited numerous artists to stop by and say a few words. They’ll express their views towards the connection between art and commerce, but all while everyone enjoys a taste of Halbe. Tunes will be provided by Mr. Wix, Bonne Reijn and Salon Soundsystem. And just to tease you that little bit extra, a little bird told me that some very big news on the cultural front will be released on the night! Feature image by Bram Spaan, flyer by Adriaan Mellegers.